I am back! Don’t get much time for blogging and cooking over the summer as I try not to spend too much time at home at the weekends but now its getting dark and cold my kitchen is beckoning! I went for a Chinese meal at weekend ( Phoenix City – Stalybridge) and it was very nice! Not as good as my preferred Szechuan style of Chinese cooking but not bad at all. 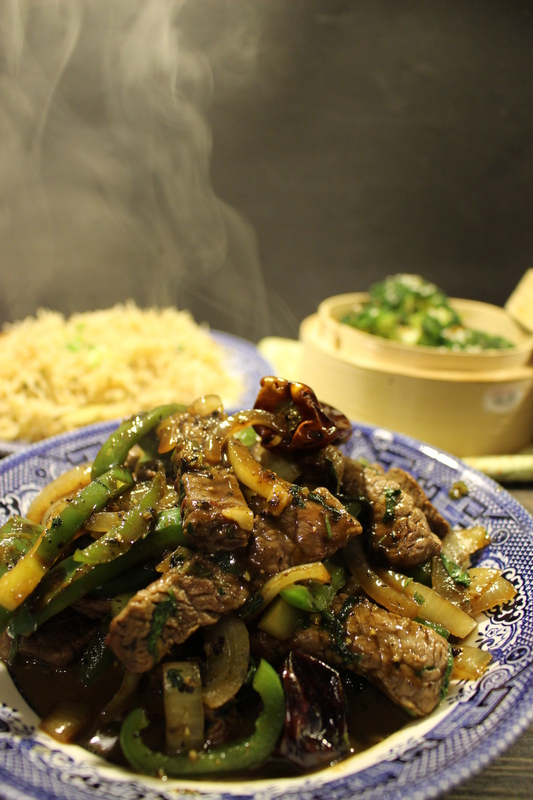 We ordered a sizzling beef fillet with pepper sauce dish so I decided to try and recreate something similar but with a bit of extra veg and a bit of spice and here it is! 1 lb / 500 g thinly sliced rump, sirloin or fillet. Not a beef that needs a lot of cooking as it will be flash fried. Handful of chopped coriander – leaves and stalks. Slice your steak thinly and season with salt and set aside. Mix the soy sauce, honey, oyster sauce, Chinese cooking wine, water and chilli flakes. Add the oil to a hot wok or frying pan and cook the onions and green peppers for about 5 minutes over a moderate heat until soft making sure you don’t burn them. Add the garlic and cook for a few more minutes. Add the sauce mixture and stir until it starts to reduce, if you want a thicker consistency add the cornflour sauce and stir until it thickens. In a separate pan heat some more oil and fry the steak for just a few minutes until brown all over the outside, try not to cook too long or it will get dry. combine the contents of both pans and give a good stir and then garnish with some chopped coriander and a little drizzle of sesame oil. You want to try and keep the steak “medium” especially if you are using fillet! Serve with egg fried rice and don’t eat the dried chillies!! I served with some stir fried rice noodles with added onions, beansprouts, spring onion and soy sauce and some steamed broccoli stir fried with garlic, ginger, sesame seeds and a drizzle of honey. I had no rice. This was a quick 10 minute tea and as tasty as a takeaway, with less calories. It will be made again soon! Next King prawn spaghetti with roast tomato, garlic and chilli sauce.